But that’s not exactly what this column is about. I mention that because it’s context. See, my family wanted to know what I wanted for my 50th birthday and I was kind of stumped. I knew I wanted something special and personal. And I knew I wanted something to do with Batman. Because, y’know, obviously. And I considered a lot of things but nothing seemed right. I didn’t want to have something fancy for the sake of it. 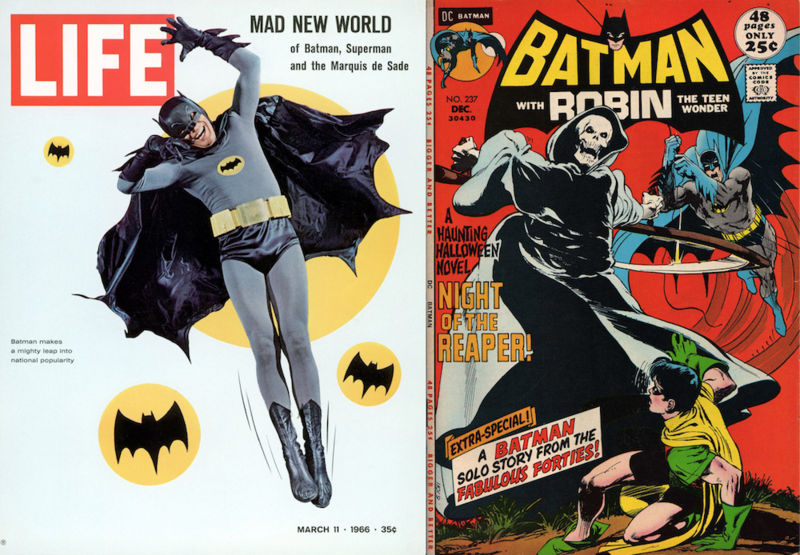 Now, I’ve long said that it was Adam West who got me into Batman and that Neal Adams was the one who hard-wired me for comics. I’m not the fan and writer I am today without either one of them. And it’s funny to me that even after decades have passed there are still people who can’t reconcile both versions — the lighter, funnier one who gave us kids such a sense of wonder and adventure and the darker, moodier one who speaks to our drive and determination. Hell, even I rejected the Adam West version for years in my teens and 20s before I came full circle. But I don’t understand anyone who still harbors that anti-West resentment. There’s room for all. So when I started thinking about my 50th, I wanted something that celebrated both. 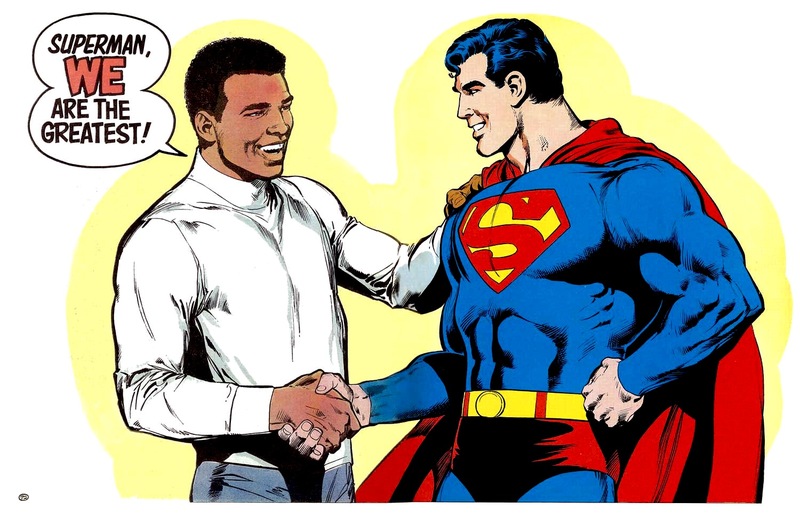 And then it hit me — and it was a bona fide epiphany: What if I could commission Neal Adams to do a piece with his Batman shaking hands with Adam West, just as Ali and Superman shook on it at the end of their epic adventure. So a big thank you to Neal Adams, his daughter Kris Adams Stone — and of course my wife Wendy and son Sam for making this the perfect birthday. That is simply fantastic! Happy Birthday, Dan! Oh man, you dropped the mic on this one. Mind blown. Happy birthday, and thank you so much for sharing. So let’s start it right here and now, Neal has go to do an issue of Batman ’66! Happy birthday (! ), and thanks for your terrific work on Dimension 13. The Adams commission is magnificent both in concept and in execution. 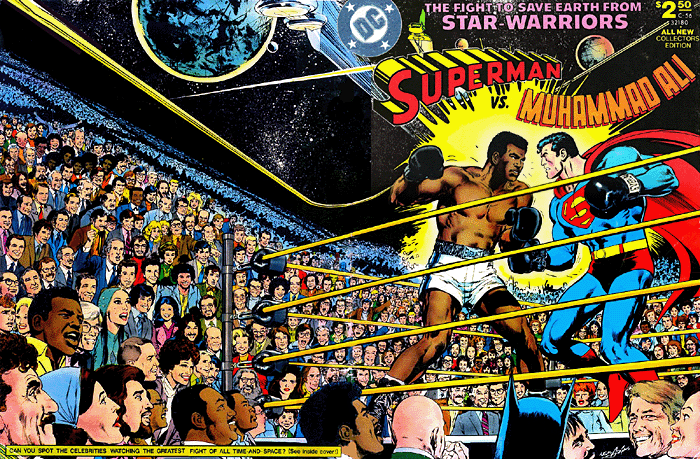 Neal Adams is a national treasure (a cliche, but true nonetheless), and I appreciate the way you often highlight his work (both past and present). What a delicious gift ! Hardest working fan deserves it. Too cool! Really dig that. I like his attention to detail. Welcome to 50. Happy Birthday. I turned 50 in July. It’s a great picture! Batman has always been my number one from my early beginnings. Back in the 60s some friends of my parents met Adam West on a plane flight and he signed an autograph on a Batman TV series post card that I still have. In any incarnation Batman is the undeniable super hero. Absolutely lovely! Happy Birthday, Dan!!!! 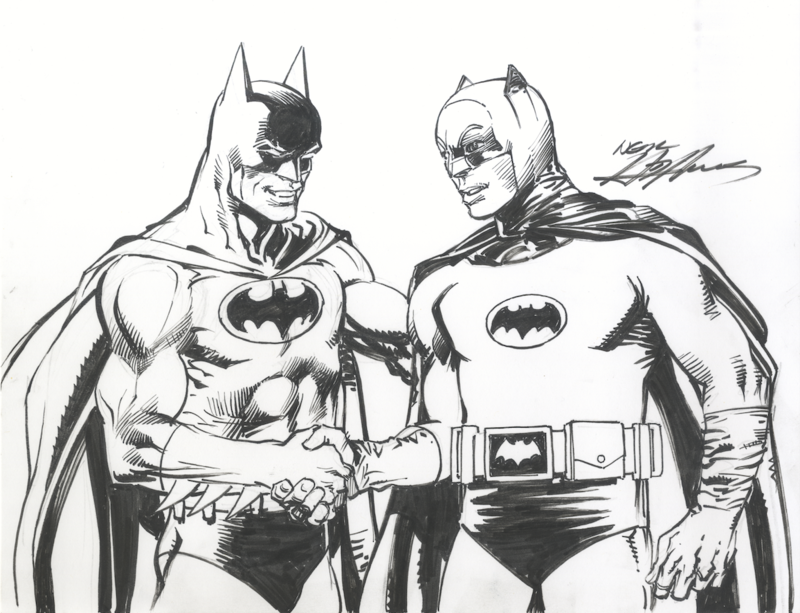 Those two incarnations of Batman are key in my life as well so that Neal Adams art says it all. Enjoy your 50s. I’ve just got one more year left in that decade, myself. I have a Batman 66 blank variant that this would look cool on. Very nice thanks for sharing. That’s a perfect picture for a 50th birthday present! I’m a little jealous. This line has me feeling like a 5-year-old again.